When was the crisis? Where did the crisis occur? What happened initially? For centuries, the natural advantages allowed human breast milk to retain a monopoly in the infant food market. There was no competition because there was no need for an alternative, and breast milk satisfied the needs of billions of babies and their mothers (Corporate Crime and Violence April 1987, Volume 8, Number 4). During the late 1800s, Nestlé developed an infant formula as a substitute for human milk to “save the life of an infant who could not be breast-fed”. But the percentage of women throughout the world who bore children incapable of being breast-fed was small, and Henri Nestle, an entrepreneur, could not expect to make much money selling his substitute for human milk. Therefore, the company decided to make its pitch not only to mothers who could not breast-feed their infants but to a much larger market – mothers who were perfectly capable of breast-feeding their babies. 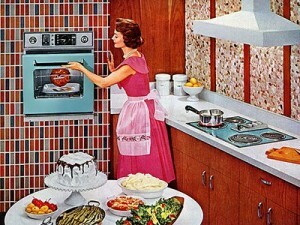 Nestlé had to convince millions of mothers that breast-feeding was not as good for the baby as a bottle-feeding. And it did (Corporate Crime and Violence April 1987, Volume 8, Number 4). Nestlé became one of the leading manufacturers of infant formula promoting the products in such a way that mothers all over the world, who did not have any problems with breast-feeding, began feeding their babies with the baby formula products out of the bottle. Nestlé, as one of the leading multinational corporations, became involved in a very well-organized boycott campaign during 1970s-1980s, and the timeline of the events which followed right after vividly proved the importance of this case and the subject itself on the global arena. This conflict demonstrated that companies have to constantly preserve and enhance their legitimacy in the public eye. 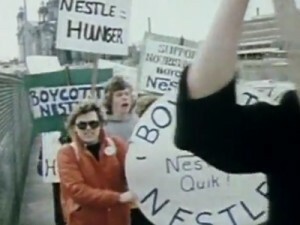 Outrage started in the 1970s, when Nestlé corporation was accused of promoting the baby formula which negatively affected the mothers in the third world countries. It has been stated that the baby formula was less healthy and more expensive than breast milk. A boycott was launched in the United States on July 7 1977 against Nestlé and expanded into Europe in the early 1980s (Business Insider). Nestlé’s marketing techniques in promotion of the use of the infant fromula in the Third World countries have been considered unethical. Nestlé was also not quite well acting in accordance with the established moral standards worldwide. The company used very aggressive marketing what also included hiring unqualified sales girls who were promoting the baby formula without possessing enough knowledge of the formula itself and its safety requirements. Nestlé, as one of the leading nutrition multinationals, should have been more aware of how the baby formula should have been promoted and advertised in the Third World countries where the level of povery, stagnation, education and cultural development are lower than compare to the developing or developed countries. Nestlé somehow ignored the problems with water supplies, cleanliness of water, and also how mothers in less developed countries would keep the bottles sterile and clean (Feeding and Nutrition of Infants and Young Children). 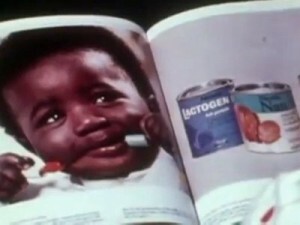 Advertisements and posters were promoting the baby formula in such a way as it has been perceived as a new “modern” and “western” way of bottle-feeding the babies. The ads also ignored the ethnicity of many countries and focused their visuals showing mostly white children. There were slogans used in Nestlé’s ads and labeling such as “100% complete nutrition” and “Now even closer to mothers milk”, misleading mothers to thinking formula is as good, almost as good, or even better than their own milk (Business Insider). Even though the link between bottle-feeding and infant diseases and deaths was brought to public attention in the early 1960s, the problem did not seem very alarming until 1970s when a few leading newspaper agencies published their articles. First, the New Internationalist published the article on Nestlé’s marketing practices in 1973, called “Babies Mean Business”, which described in brutal details how the company’s baby formula negatively affected mothers and their infants in the Third World countries. 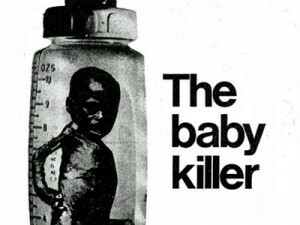 In 1974 War On Want, anti-poverty charity and organization based in London, published a booklet ”The Baby Killer” which increased awareness of the importance of the existing problem related to the company’s unethical ways of marketing the baby formula (Business Insider). There were two cases in the Nestlé boycott history that affected the course of the boycott and raised awareness of the baby formula problem globally in the eye of the public. In April 1977, the Columbian General Hospital noticed that the number of kids who fell seriously ill was related to the bacteria found at the Nestlé factory (Case:”Nestle Infant Formula killing babies”). 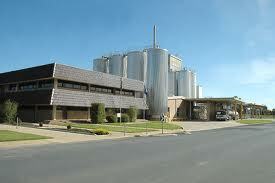 After the investigation in 1976 it has been revealed that the bacteria was found at the Nestlé Tongala plant. The spray drier, which turned liquid milk into powder, contained cracks. The Health Department was not informed by the company as they were afraid of losing money, and the drier continued its operation process for the next full months (Case:”Nestle Infant Formula killing babies”). In 1978 Senator Edward Kennedy held a series of U.S. Senate Hearings on the industry’s unethical marketing practices which much further damaged Nestlé’s reputation and suggested the need for international consensus. 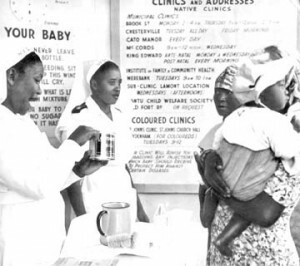 Senator Kennedy asked the World Health Organization (WHO) to conduct a series of hearings about the infant health and nutrition, and have an international conference to address all the issues related to the baby formula scandal. However, in 1988 a few social rights and activist groups again showed their concern that Nestlé did not completely comply with 1984 WHO code of rules and attempted to relaunch the boycott against Nestlé. They were convinced little has changed even after the boycott was ended. The boycott against Nestlé’s products and the infant formula manufacturers generated the largest support of the consumer movement in North America, and its impact has still been felt in the industry around the world. The Nestlé boycott has been lasting for 7 years in 65 countries and ended in 1984 after the world’s leading organizations took a variety of restrictive actions against Nestlé. The company lost more than $5.8 million in revenues. Helmut Maucher. 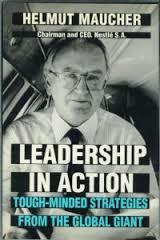 “Leadership in Action: Tough Minded Strategies from the Global Giant”. It is a matter of fact that the opinion about the Nestlé management and the company’s ways of doing business in accordance with ethical conduct and issues of morality, which has been formed in the heads of the developed nations, was a very negative one. Former CEO of Nestlé Helmut Maucher wrote a book, called “Leadership in Action: Tough Minded Strategies from the Global Giant”, where he masterfully presented what he has witnessed on his own while being in charge of managing the company and also advantages and disadvantages of the management style Nestlé has chosen to operate within. 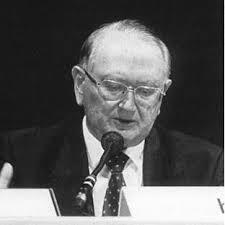 He made the statement that “ethical decisions which injure a company’s ability to compete are actually immoral” (Helmut Maucher). In an interview Peter Brabeck-Letmathé, an official Maucher’s successor, the Chairman and former CEO of the Nestlé Group, was asked to express his opinion in accordance with the statement of Helmut Maucher. He commented the following on this statement taking into consideration how the baby formula has been marketed worldwide. “I decided to eliminate the word ethical from Nestlé because it’s a word which divides people as opposed to uniting them. Ethics, if you look into dictionaries, are a set of moral standards within a very specific unit of society, and ethical standards in Britain, Switzerland, Chile and China vary to a large extent. And because this word is more likely to divide than to unite we don’t talk about ethics at Nestlé. We talk about responsibility. Our responsibility to our shareholders, our employees, and all other stakeholders. It’s true that we do have a social responsibility that corresponds to a global company as opposed to the group interests of one community or another community” (Peter Brabeck-Letmathe). “FOOD: The Formula Flap”. Time Magazine. July 12 1976. <http://www.time.com/time/magazine/article/0,9171,914298,00.html>. Furnus, Graham. “Nation Review of Medicine.” 30 Jan. 2004. 3 Feb. 2007 <http://www.nationalreviewofmedicine.com/issue/2004_01_30/article02.html>. Colin Boyd. The Nestlé Infant Formula Controversy and a Strange Web of Subsequent Business Scandals. Journal of Business Ethics. Volume 106. Springer 2012. INFACT USA Canada. “Nestlé Products to Boycott“. <http://www.infactcanada.ca/nestle_boycott_product.htm>. Alix M Freedman. “Nestle Ad Claims For Baby Formula Probed in 3 States”. ProQuest Historical Newspapers: Wall Street Journal. Mar 2 1989. “Every Parent Should Know The Scandalous History Of Infant Formula”. Business Insider. June 25th 2012. Case:”Nestle Infant Formula killing babies”. <http://www.docstoc.com/docs/123077702/Case-Nestl%EF%BF%BDs-Infant-Formulas-Killing-Babies>. “Nestle’s Bid to Crash Baby-Formula Market In the U.S. Stirs a Row”. ProQuest Historical Newspapers: The Wall Street Journal. Feb 16, 1989.